I remember the time that I accepted Jesus Christ as my Savior. I was four years old (almost five). My dad, a missionary to Indonesia, was preaching in our garage to the mission that he had just started. At that time I hadn’t learned Indonesian and my mother was teaching us our Sunday school class in the living room of our house. She was teaching about Noah’s ark and the flood and how everyone that wasn’t in the ark died. Everyone had the opportunity to get in the ark but only those that believed that God was going to destroy the earth with a flood actually got in and were saved. After it started raining it was to late to get in the boat. That is the way it is with trusting Christ as your savior. Jesus Christ has given everyone the opportunity to trust Him as their Savior, but only those that do will be born again and go to heaven. Those that don’t will die and go to hell. After you die it is too late. Your opportunity is over. You have to have faith and believe before it is too late. It is impossible to please God without faith. When you are dead you will experience the truthfulness of what God says, you will know! There will be no more faith involved. 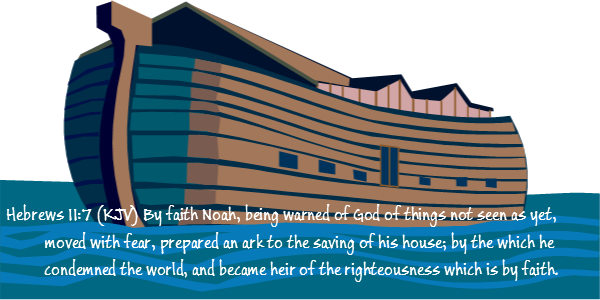 Hebrews 11:7 (KJV) By faith Noah, being warned of God of things not seen as yet, moved with fear, prepared an ark to the saving of his house; by the which he condemned the world, and became heir of the righteousness which is by faith. That day, in our living room, in my mothers lap, I put my faith in Jesus Christ to be my Savior and he saved me. I knew that I was a sinner and that I wasn’t in the boat. I wanted to be in the boat. I knew that I couldn’t save myself and I repented of my sins and put my faith in Jesus Christ to save me, and He did! I am born again, I have everlasting life, I am saved! John 3:17 (KJV) For God sent not his Son into the world to condemn the world; but that the world through him might be saved. I have eternal life and I KNOW that there is a God and that Jesus Christ is the true and living God. I know. I tried it and it worked! You can be saved too! When you realize that you cannot save yourself through your own works and you repent of your sins and put your faith in Jesus Christ and confess him as your Savior, you will be saved. Romans 10:10(KJV) For with the heart man believeth unto righteousness; and with the mouth confession is made unto salvation. Why not allow Jesus Christ to save you today?